Warren Buffett is among the richest men in the world. Warren can buy pretty much anything he wants to, and more than most other people could ever dream of. Yet he seems to be frugal, not a big spender. But there’s one thing that even Warren Buffett cannot buy, and that is time. Time for me is also in short supply. Working in the days and then exercising, reading and blogging at night also makes you wish you had a few more hours every day. Like Warren, I also think time is the most precious thing. One thing that I have changed lately is my presence on Twitter. Right now, I haven’t been active on Twitter at all for a few months. It just takes to much of my attention and energy. That’s why I decided, at least for now, to take a Twitter break. No tweets, no retweets, nothing. So, let’s see what old Warren has to say about time. Here’s a brief transcript from a Charlie Rose interview. Warren Buffett: I mean I can buy anything I want basically, but I can’t buy time. Charlie Rose: And so to to have time is the most precious thing you can have? Warren Buffett: Yes, I better be careful with it. There is no way I will be able to buy more time. Charlie Rose: And living in Omaha makes that easy? Warren Buffett: That makes it a lot easier. I, for 50 whatever, well for 54 years I spent five minutes going each way now. Just imagine that was a half an hour each way. You know. I know the words to a lot more songs and that’s about it. Charlie Rose: It adds up. Doesn’t it? Warren Buffett: It really adds up. Now if you’re doing an hour a day difference coming and going that’s two and a half percent of the person’s work week. That means 40 years you’re talking about a year. Here’s an interview with Warren Buffett – published February 27, 2017 on CNBC – where Buffett talks to Becky Quick about retail, Jeff Bezos, and the power of Amazon’s business model. Becky Quick: A major investor I spoke with recently asked me this question, I’m not sure if it was supposed to be on the record or not, so I won’t use the name. But this investor said that here she had heard you recently making some comments about Amazon where you where very complimentary of Amazon, it’s founder Jeff Bezos, said he’s probably the best manager you’ve ever seen. Warren Buffett: I think maybe he is, yeah. You know, I’ve said that. I mean, it’s remarkable I mean, here a guy, you know, gets in a car with his wife to travel. Leaves you on and starts travel across thinks “How am I going to take over the world?” Maybe I’ll sell books online. He is one terrific business person. Warren Buffett: Well, that’s a good question, but I don’t have a good answer. Obviously I should have bough it a long ago, because I admired him long ago. But I didn’t understand the power of the model as I went along, and the price always seemed to more than reflect the power of the model at that time. So it’s one I missed big time. Becky Quick: Is it to late? Or you just don’t know? Warren Buffett: I just don’t know, yeah. Retailing is tough for me to figure out. I mean, if you go back to when I was a kid, in every town the guy that owned the big department store was king. I mean, whether it was Marshall Field, you know, or Dayton, or Hudson in Detroit, or Fredrick & Nelson in Seattle. You name it. J. L. Brandeis in Omaha. The department store was king. And people said “What can happen to them?” You know, it’s down there with the street car lines crossed, and the women took the street car to shop there and they could see five hundred spools of thread, and five hundred wedding dresses. And they couldn’t see anything like that. It offered this incredible array of goods. And somebody came along with a shopping center. And instead of making it vertical with all this display by one person, they spread it out one by many. And now comes the Internet. And that’s it, all of it, variety of things that you can get to very easily. People love variety, they love low prices and all bunch of things. So it just keeps evolving and the great department stores, many of them have disappeared and the rest are under pressure. There’s an article published by Morningstar today that discusses Amazon’s $13.7 billion acquisition of Whole Foods. According to Morningstar, Amazon gets a wide economic moat rating. The article brings up and discusses some of the different parts making up Amazon’s wide moat, that is, its sustainable competitive advantages. To read the article, click here. What exactly goes through your mind when you’re actually making an investment? Warren Buffett got this question during an interview and talked for a moment about a few of the things that come to his own mind when he’s trying to evaluate a certain business and it’s future economic potential. What’s the most important thing to do as a manager of a business? According to Warren Buffett it’s all about “widening the moat.” Nothing more, nothing less. For some input and ideas about what makes (or breaks) a moat, check out this slide deck from Pat Dorsey. Excerpt below from Warren Buffett’s 2000 letter to shareholders. Emphasis added. Leaving aside tax factors, the formula we use for evaluating stocks and businesses is identical. Indeed, the formula for valuing all assets that are purchased for financial gain has been unchanged since it was first laid out by a very smart man in about 600 B.C. (though he wasn’t smart enough to know it was 600 B.C.). The oracle was Aesop and his enduring, though somewhat incomplete, investment insight was “a bird in the hand is worth two in the bush.” To flesh out this principle, you must answer only three questions. How certain are you that there are indeed birds in the bush? When will they emerge and how many will there be? What is the risk-free interest rate (which we consider to be the yield on long-term U.S. bonds)? If you can answer these three questions, you will know the maximum value of the bush – and the maximum number of the birds you now possess that should be offered for it. And, of course, don’t literally think birds. Think dollars. Aesop’s investment axiom, thus expanded and converted into dollars, is immutable. It applies to outlays for farms, oil royalties, bonds, stocks, lottery tickets, and manufacturing plants. And neither the advent of the steam engine, the harnessing of electricity nor the creation of the automobile changed the formula one iota – nor will the Internet. Just insert the correct numbers, and you can rank the attractiveness of all possible uses of capital throughout the universe. Common yardsticks such as dividend yield, the ratio of price to earnings or to book value, and even growth rates have nothing to do with valuation except to the extent they provide clues to the amount and timing of cash flows into and from the business. Indeed, growth can destroy value if it requires cash inputs in the early years of a project or enterprise that exceed the discounted value of the cash that those assets will generate in later years. Market commentators and investment managers who glibly refer to “growth” and “value” styles as contrasting approaches to investment are displaying their ignorance, not their sophistication. Growth is simply a component – usually a plus, sometimes a minus – in the value equation. Alas, though Aesop’s proposition and the third variable – that is, interest rates – are simple, plugging in numbers for the other two variables is a difficult task. Using precise numbers is, in fact, foolish; working with a range of possibilities is the better approach. Usually, the range must be so wide that no useful conclusion can be reached. Occasionally, though, even very conservative estimates about the future emergence of birds reveal that the price quoted is startlingly low in relation to value. (Let’s call this phenomenon the IBT – Inefficient Bush Theory.) To be sure, an investor needs some general understanding of business economics as well as the ability to think independently to reach a well-founded positive conclusion. But the investor does not need brilliance nor blinding insights. At the other extreme, there are many times when the most brilliant of investors can’t muster a conviction about the birds to emerge, not even when a very broad range of estimates is employed. This kind of uncertainty frequently occurs when new businesses and rapidly changing industries are under examination. In cases of this sort, any capital commitment must be labeled speculative. Now, speculation – in which the focus is not on what an asset will produce but rather on what the next fellow will pay for it – is neither illegal, immoral nor un-American. But it is not a game in which Charlie and I wish to play. We bring nothing to the party, so why should we expect to take anything home? The line separating investment and speculation, which is never bright and clear, becomes blurred still further when most market participants have recently enjoyed triumphs. Nothing sedates rationality like large doses of effortless money. After a heady experience of that kind, normally sensible people drift into behavior akin to that of Cinderella at the ball. They know that overstaying the festivities – that is, continuing to speculate in companies that have gigantic valuations relative to the cash they are likely to generate in the future – will eventually bring on pumpkins and mice. But they nevertheless hate to miss a single minute of what is one helluva party. Therefore, the giddy participants all plan to leave just seconds before midnight. There’s a problem, though: They are dancing in a room in which the clocks have no hands. Last year, we commented on the exuberance – and, yes, it was irrational – that prevailed, noting that investor expectations had grown to be several multiples of probable returns. One piece of evidence came from a Paine Webber-Gallup survey of investors conducted in December 1999, in which the participants were asked their opinion about the annual returns investors could expect to realize over the decade ahead. Their answers averaged 19%. That, for sure, was an irrational expectation: For American business as a whole, there couldn’t possibly be enough birds in the 2009 bush to deliver such a return. Far more irrational still were the huge valuations that market participants were then putting on businesses almost certain to end up being of modest or no value. Yet investors, mesmerized by soaring stock prices and ignoring all else, piled into these enterprises. It was as if some virus, racing wildly among investment professionals as well as amateurs, induced hallucinations in which the values of stocks in certain sectors became decoupled from the values of the businesses that underlay them. This surreal scene was accompanied by much loose talk about “value creation.” We readily acknowledge that there has been a huge amount of true value created in the past decade by new or young businesses, and that there is much more to come. But value is destroyed, not created, by any business that loses money over its lifetime, no matter how high its interim valuation may get. What actually occurs in these cases is wealth transfer, often on a massive scale. By shamelessly merchandising birdless bushes, promoters have in recent years moved billions of dollars from the pockets of the public to their own purses (and to those of their friends and associates). The fact is that a bubble market has allowed the creation of bubble companies, entities designed more with an eye to making money off investors rather than for them. Too often, an IPO, not profits, was the primary goal of a company’s promoters. At bottom, the “business model” for these companies has been the old-fashioned chain letter, for which many fee-hungry investment bankers acted as eager postmen. But a pin lies in wait for every bubble. And when the two eventually meet, a new wave of investors learns some very old lessons: First, many in Wall Street – a community in which quality control is not prized – will sell investors anything they will buy. Second, speculation is most dangerous when it looks easiest. At Berkshire, we make no attempt to pick the few winners that will emerge from an ocean of unproven enterprises. We’re not smart enough to do that, and we know it. Instead, we try to apply Aesop’s 2,600-year-old equation to opportunities in which we have reasonable confidence as to how many birds are in the bush and when they will emerge (a formulation that my grandsons would probably update to “A girl in a convertible is worth five in the phonebook.”). Obviously, we can never precisely predict the timing of cash flows in and out of a business or their exact amount. We try, therefore, to keep our estimates conservative and to focus on industries where business surprises are unlikely to wreak havoc on owners. Even so, we make many mistakes: I’m the fellow, remember, who thought he understood the future economics of trading stamps, textiles, shoes and second-tier department stores. Lately, the most promising “bushes” have been negotiated transactions for entire businesses, and that pleases us. You should clearly understand, however, that these acquisitions will at best provide us only reasonable returns. Really juicy results from negotiated deals can be anticipated only when capital markets are severely constrained and the whole business world is pessimistic. We are 180 degrees from that point. Content in the table below is based on Warren Buffett’s discussion – in his letter to shareholders in 2000 – on how to value an asset. Excerpt below from Warren Buffett’s 2007 letter to shareholders. Emphasis added. Let’s take a look at what kind of businesses turn us on. And while we’re at it, let’s also discuss what we wish to avoid. Charlie and I look for companies that have a) a business we understand; b) favorable long-term economics; c) able and trustworthy management; and d) a sensible price tag. We like to buy the whole business or, if management is our partner, at least 80%. When control-type purchases of quality aren’t available, though, we are also happy to simply buy small portions of great businesses by way of stockmarket purchases. It’s better to have a part interest in the Hope Diamond than to own all of a rhinestone. 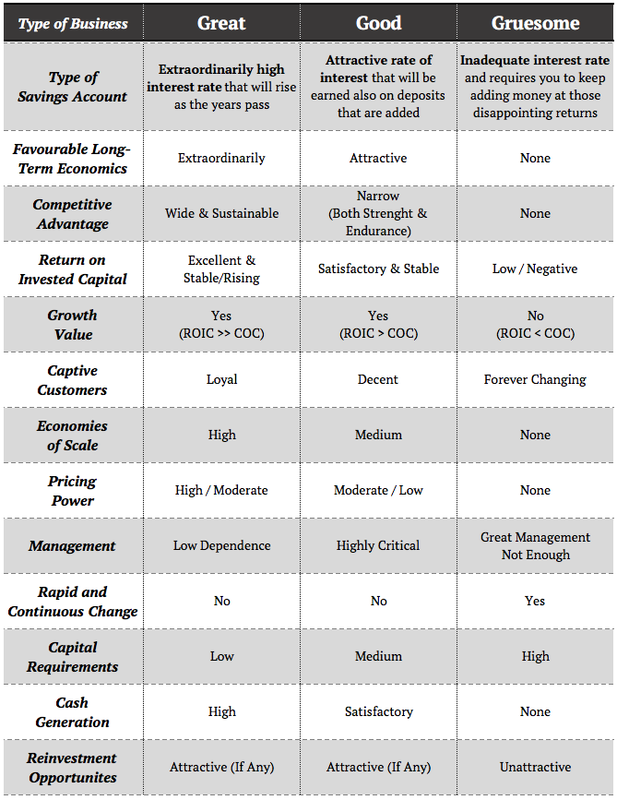 A truly great business must have an enduring “moat” that protects excellent returns on invested capital. The dynamics of capitalism guarantee that competitors will repeatedly assault any business “castle” that is earning high returns. Therefore a formidable barrier such as a company’s being the lowcost producer (GEICO, Costco) or possessing a powerful world-wide brand (Coca-Cola, Gillette, American Express) is essential for sustained success. Business history is filled with “Roman Candles,” companies whose moats proved illusory and were soon crossed. But if a business requires a superstar to produce great results, the business itself cannot be deemed great. A medical partnership led by your area’s premier brain surgeon may enjoy outsized and growing earnings, but that tells little about its future. The partnership’s moat will go when the surgeon goes. You can count, though, on the moat of the Mayo Clinic to endure, even though you can’t name its CEO. Long-term competitive advantage in a stable industry is what we seek in a business. If that comes with rapid organic growth, great. But even without organic growth, such a business is rewarding. We will simply take the lush earnings of the business and use them to buy similar businesses elsewhere. There’s no rule that you have to invest money where you’ve earned it. Indeed, it’s often a mistake to do so: Truly great businesses, earning huge returns on tangible assets, can’t for any extended period reinvest a large portion of their earnings internally at high rates of return. Let’s look at the prototype of a dream business, our own See’s Candy. The boxed-chocolates industry in which it operates is unexciting: Per-capita consumption in the U.S. is extremely low and doesn’t grow. Many once-important brands have disappeared, and only three companies have earned more than token profits over the last forty years. Indeed, I believe that See’s, though it obtains the bulk of its revenues from only a few states, accounts for nearly half of the entire industry’s earnings. At See’s, annual sales were 16 million pounds of candy when Blue Chip Stamps purchased the company in 1972. (Charlie and I controlled Blue Chip at the time and later merged it into Berkshire.) Last year See’s sold 31 million pounds, a growth rate of only 2% annually. Yet its durable competitive advantage, built by the See’s family over a 50-year period, and strengthened subsequently by Chuck Huggins and Brad Kinstler, has produced extraordinary results for Berkshire. We bought See’s for $25 million when its sales were $30 million and pre-tax earnings were less than $5 million. The capital then required to conduct the business was $8 million. (Modest seasonal debt was also needed for a few months each year.) Consequently, the company was earning 60% pre-tax on invested capital. Two factors helped to minimize the funds required for operations. First, the product was sold for cash, and that eliminated accounts receivable. Second, the production and distribution cycle was short, which minimized inventories. There aren’t many See’s in Corporate America. Typically, companies that increase their earnings from $5 million to $82 million require, say, $400 million or so of capital investment to finance their growth. That’s because growing businesses have both working capital needs that increase in proportion to sales growth and significant requirements for fixed asset investments. A company that needs large increases in capital to engender its growth may well prove to be a satisfactory investment. There is, to follow through on our example, nothing shabby about earning $82 million pre-tax on $400 million of net tangible assets. But that equation for the owner is vastly different from the See’s situation. It’s far better to have an ever-increasing stream of earnings with virtually no major capital requirements. Ask Microsoft or Google. One example of good, but far from sensational, business economics is our own FlightSafety. This company delivers benefits to its customers that are the equal of those delivered by any business that I know of. It also possesses a durable competitive advantage: Going to any other flight-training provider than the best is like taking the low bid on a surgical procedure. Nevertheless, this business requires a significant reinvestment of earnings if it is to grow. When we purchased FlightSafety in 1996, its pre-tax operating earnings were $111 million, and its net investment in fixed assets was $570 million. Since our purchase, depreciation charges have totaled $923 million. But capital expenditures have totaled $1.635 billion, most of that for simulators to match the new airplane models that are constantly being introduced. (A simulator can cost us more than $12 million, and we have 273 of them.) Our fixed assets, after depreciation, now amount to $1.079 billion. Pre-tax operating earnings in 2007 were $270 million, a gain of $159 million since 1996. That gain gave us a good, but far from See’s-like, return on our incremental investment of $509 million. Consequently, if measured only by economic returns, FlightSafety is an excellent but not extraordinary business. Its put-up-more-to-earn-more experience is that faced by most corporations. For example, our large investment in regulated utilities falls squarely in this category. We will earn considerably more money in this business ten years from now, but we will invest many billions to make it. Now let’s move to the gruesome. The worst sort of business is one that grows rapidly, requires significant capital to engender the growth, and then earns little or no money. Think airlines. Here a durable competitive advantage has proven elusive ever since the days of the Wright Brothers. Indeed, if a farsighted capitalist had been present at Kitty Hawk, he would have done his successors a huge favor by shooting Orville down. The airline industry’s demand for capital ever since that first flight has been insatiable. Investors have poured money into a bottomless pit, attracted by growth when they should have been repelled by it. And I, to my shame, participated in this foolishness when I had Berkshire buy U.S. Air preferred stock in 1989. As the ink was drying on our check, the company went into a tailspin, and before long our preferred dividend was no longer being paid. But we then got very lucky. In one of the recurrent, but always misguided, bursts of optimism for airlines, we were actually able to sell our shares in 1998 for a hefty gain. In the decade following our sale, the company went bankrupt. Twice. To sum up, think of three types of “savings accounts.” The great one pays an extraordinarily high interest rate that will rise as the years pass. The good one pays an attractive rate of interest that will be earned also on deposits that are added. Finally, the gruesome account both pays an inadequate interest rate and requires you to keep adding money at those disappointing returns. When I got home from work today I found this new episode of the David Rubenstein Show available, this time a talk between David Rubenstein and Warren Buffett. The interview is about 25 minutes and I spent the time on my back in my bad watching and listening, just having a good time. A spoiler here… There was no talking about Wells Fargo. The subject wasn’t even brought up. I don’t know at what date the interview was recorded, but it’s not unreasonable to believe that the interview was taped before the Wells-Fargo scandal hit the headlines. Topics discussed range from pinball machines, Harvard Business School, Benjamin Graham, Columbia Business School, Washington Post, Bill Gates, smartphones, computers, and philanthropy, bridge, search among others. When watching and listening to an interview that I find especially interesting, I’d like to put down in writing the things I enjoyed the most. I do this to share with the readers of this blog, but also to archive it in a place I know I can go back to later on. Below you’ll find the parts transcribed by me. Hope you enjoy it. David Rubenstein: You grew up in Omaha, but then you moved to Washington when your father became a congress man. How did you start you business career in Washington, with various pinball machines or golf businesses? Warren Buffett: Yeah, I was like that with a couple of businesses going. The best business we had was the pinball machine business, which was the Wilson Coin and operated a machine company, and it was named after the high school me and my partner went to. But, we had our machines in barber shops, and the barbers always wanted to put in the machines with flippers which were just coming in. But those machines cost 350 bucks, whereas an old obsolete machines cost 20 bucks. So, we always told them we’d take it up with Mr. Wilson, this mystical Mr. Wilson. He was one tough guy, I gotta tell you. David Rubenstein: So, when you graduated from high school you weren’t as interested in the academics, I assume, at that time? Warren Buffett: I was not interested. David Rubenstein: And your high school yearbook said he’s likely to be a stock-broker, but he’s very good in math. Why didn’t you go to Wharton? And why didn’t you wanna stay two years there? Warren Buffett: I didn’t wanna go to college, and… But my dad wanted me to go to college. And we didn’t have SATs then, but he practically would have done the SATs for me. So he… and the truth… I always wanted to please my dad. He was a hero to me and still is. David Rubenstein: You worked for Mr. Graham and his partnership, and how did that work? Warren Buffett: Well, it was terrific in the sense a was working for my hero. But Ben was going to retire in a couple of years. And, so I was only back there a year and a half. But, every day I was excited about being able to work for him. David Rubenstein: So, what you were good at where picking stocks according to his formula, which is to look for stocks that were undervalued, now call value investing. Did you realise that he had some principles that were very unique, and is that why you followed his guidance? Warren Buffett: Well, by the time I went to work for him I probably could have recited the words in his book better than he could. I’d read his books multiple times, and so it was more a question of being inspired by him than it was learning something new from him. David Rubenstein: What would you say is the reason for your ability to do this? Is it that you study the companies more than anybody else? You’ve stuck to your principles? You were smarter than other people? Or people were just caught up with fads, and you didn’t get caught up with fads? What would you say is the reason for the success? Warren Buffett: Well, the first two to quite an extent. We bought businesses that we thought were decent businesses at sensible prices and we had good people to run them. But we also bought marketable securities in Berkshire. Over time the emphasis shifted from marketable securities over to buying businesses. David Rubenstein: What was the theory behind buying a railroad? Cause people thought they were kind of fossils, these businesses. Warren Buffett: The railroad business had a bad century, the kind of like Chicago Cubs. Everybody has a bad century now and then. David Rubenstein: Over the years you’ve bought a number of companies and had stakes in companies, one of the ones I know very well is Washington Post. How did that come about? Warren Buffett: Well, in 1973… the Washington Post Company had gone public in 1971, right about the Pentagon Papers time. But in ’73 the Nixon administration was through Bebe Rebozo who was a pale of Nixon, they were challenging the licenses of two of the four television stations the Post owned. So the stock went from 47 down to 16. Now at 16 there were about five million shares outstanding. So the whole Washington Post company was selling for 80 million dollars, and that included the newspaper, four big TV stations, Newsweek, and some other assets, and no debt to speak of. So, the Washington Post Company which was intrinsically worth four or five hundred million dollars was selling for about eighty million in the market. We bought most of our stock at an equivalent of 100 million in the market. And it was ridiculous, I mean, you had a business that unquestionable worth four or five times what it was selling for. And Nixon wasn’t going to put them out of business. David Rubenstein: When you’re doing these analyses, then and now. Do you have computers that help you? How do you actually read all materials? And how did you in those days get the materials to read about the Washington Post? How do you do it today? David Rubenstein: So you get the annual reports, and you read them. Just like other people read novels, you read annual reports? David Rubenstein: And then, do you do the calculations in… what things are worth, in your head? David Rubenstein: Do you use a computers to help you? Warren Buffett: No. If you need to carry something out to four decimal places, forget it. David Rubenstein: Today, do you use a computer today, even? Warren Buffett: I use it to play bridge, and I use it to go to search… a lot. David Rubenstein: What would you say are some of the highlights, the deals that you’re most proud of? Let’s take one that you did recently. The biggest deal you’ve ever done was Precision Castparts, about 47 billion dollars. Warren Buffett: Yeah, it was between 42 and 43 billion of cash, and then we assumed about four billion of debt. David Rubenstein: Okay, so how much… for to spend 47 billion, you spent a year studying the company? David Rubenstein: How much time did you spend with the CEO? David Rubenstein: That was it? Did you hire any investment bankers to help with the analysis? David Rubenstein: Do you ever hire any investment bankers to help analyse a company? Warren Buffett: No. Not to help analyse a company. David Rubenstein: Now, people must call you every day and say: “I have a deal for you. It’s perfect.” And how often do any of these deals pan out? Warren Buffett: They don’t call every day, and we’ve made our criteria fairly clear. So there’s relatively few that call. And when somebody calls I can usually tell within two or three minutes whether a deal is likely to happen or not. There’s just some half a dozen filters, and it either makes it through the filters, or it doesn’t. Click here to see the whole interview.